(GLARING Hypocrisy) Europe has a long and bloody history. Empires have risen and fallen, wars have repeatedly redefined national borders, and the human cost has been untold amounts of death and suffering. Today, however, there are no wars within Europe and we are all, apparently, ‘united in diversity’. The motto of the European Union since 2000, these three short words tell us exactly what we should think. No doubt no expense was spared in hiring a top PR firm to come up with this nifty-sounding Orwellian slogan that, in true Big Brother fashion, works to brainwash the masses into believing we truly are stronger together — a ‘many heads are better than one’ scenario. 1992 EU poster (left). Pieter Bruegel’s Tower of Babel painting (right). Rewind almost 3,000 years to the first account of the mythological hero, Heracles, who was tasked with twelve labours by Hera in the hope that he would be defeated and killed. His second labour was to slay the Hydra, a many-headed serpentine creature that was raised by Hera to kill Heracles, and which lived in the lake of Lerna near the entrance to the Underworld. Heracles, however, proved too wily for the Hydra. Using strength and ingenuity, and the assistance of his nephew, Iolaus, Heracles decapitated each head until none were left and the Hydra was dead. While the mythical creature will only ever be such, the metaphorical many-headed Hydra is alive and thriving in the form of the European Union today. For the moment, let’s take a much shorter trip back in time to the 1920s when Hemingway was living and travelling in Europe. With each country still sovereign and its people unique, Hemingway experienced life in Paris as very different to that in Pamplona, the Italians unlike the Austrians, and each border crossing a doorway to a unique combination of landscape, language, customs and food. The biggest obstacle to the accomplishment of the United States of Europe is the one thousand years old rivalry between the two most populated nations of Pan-Europe: Germany and France. After reading Pan-Europa, German-Jewish banker and Freemason Max Warburg contacted fellow Freemason Baron Louis de Rothschild to facilitate an introduction to Kalergi, a meeting that resulted in Warburg donating 60,000 marks to finance the movement for three years. This was just the beginning of 1924. A year later, in 1925, Warburg arranged for Kalergi to travel to the United States to meet his brother Paul Warburg and Jewish-American financier Bernard Baruch. That same year Kalergi publishedPraktischer Idealismus (Practical Idealism). [Kalergi] was encouraged and financed by a series of American masons who wanted to create thus, according to the American model (the first masonic state in history), the United States of Europe. An interesting side note is that Max Warburg’s funding of Pan-Europa came just seven years after he worked with Kaiser Wilhelm II and the German High Command to orchestrate Lenin’s return to Russia in a sealed train in April 1917. Lenin and his fellow exiles on the train were carrying $6 million in gold to finance the overthrow of the Provisional Government. Thus, in the early 20th century the capitalists of Wall Street not only funded a movement to unite all Western European countries, they also funded communism, which, as we know, united all Eastern European countries under the Soviet Union. Europe will be able not only to maintain herself, but to consolidate and build herself up, once she has broken down the customs barriers and his united herself economically to the inexhaustible natural riches of Russia. “The United States of Europe” – a purely revolutionary perspective – is the next stage in our generally revolutionary perspective. Freemasons were also working on another front towards a united Europe. In September 1929, Freemason Aristide Briand, the French Foreign Affairs minister, gave a speech at the League of Nations (precursor to the United Nations) in which he proposed the establishment of a federal European union. The basis of his plan was economic, but his fundamental aim was political union. Since Kalergi moved in aristocratic and political circles, his ideas attracted European heads of state as supporters and collaborators, as well as known figures such as Sigmund Freud, Thomas Mann and Albert Einstein, all Freemasons. In 1926, the first Pan-Europa meeting took place in Vienna with 2,000 attendees. At this meeting Kalergi was elected as president of the Central Council, a position he held for 49 years, until his death in 1972. He was succeeded by Otto von Habsburg. Several Jewish European leaders took a prominent part in the first Pan-European Congress which opened here Sunday, when the movement to establish a United States of Europe, modelled after the United States of America, took definite shape. 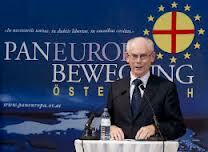 […] Many individual European Jews are furthering the Pan-European movement by giving it financial support. Count Coudenhove-Kalergi, who is married to Ida Roland, a Jewess, when interviewed by the representative of the Jewish Telegraphic Agency here expressed his opinion that the Pan-European movement ought to find particular support on the part of the Jews who are scattered throughout the various countries in Europe. The creation of the United States of Europe would be beneficial to the Jews as it would eliminate racial hatred and economic rivalry, he said. While Hemingway left Europe to return to the United States in 1928, Kalergi pushed forward with his Pan-European vision proposing Beethoven’s “Ode to Joy” as the European anthem (1929), and that there be an annual designated Europe Day (1930). Beyond these two suggestions being adopted by the current European Union, Kalergi’s influence on not only its formation but also its shape cannot be understated. The movement towards this vision picked up pace following World War II, drawing international support from Winston Churchill to Harry S. Truman, both 33rd degree masons. In December 1945 Kalergi penned an article that was published in Collier’s magazine in the United States. Truman, impressed with the ideas expressed, adopted as policy the promotion of a United States of Europe. To this end the American Committee on United Europe (ACUE) was created in 1948, with William Donovan, wartime head of the Office of Strategic Services (precursor of the CIA), appointed chairman, and Allen Dulles (CIA Director, 1953-61) vice-chairman. The ACUE heavily financed the European movement, with further covert funding being funnelled through the Ford Foundation and the Rockefeller Foundation. Behind the scenes the Council on Foreign Relations and the Bilderberg Group also backed a united Europe, with the former supporting the idea of a single currency as early as 1955. We must build a kind of United States of Europe. […] Much work has been done upon this task by the exertions of the Pan-European Union which owes so much to Count Coudenhove-Kalergi … The structure of the United States of Europe, if well and truly built, will be such as to make the material strength of a single state less important. Small nations will count as much as large ones and gain their honour by their contribution to the common cause. […] The first step is to form a Council of Europe. If at first all the States of Europe are not willing or able to join the Union, we must nevertheless proceed to assemble and combine those who will and those who can. 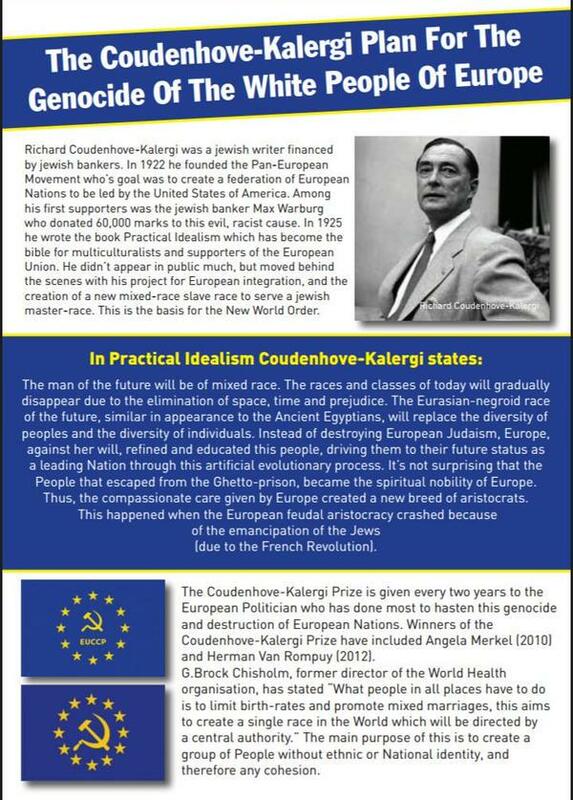 Less than a year later Kalergi founded the European Parliamentary Union in July 1947. The EPU, along with the European Movement, founded the same year by Churchill’s son-in-law Duncan Sandys, played a leading role in the Congress of The Hague in May 1948. However, the European Movement eclipsed the EPU in significance when it founded the Council of Europe in 1949, one of the current seven major institutions of the European Union today. In 1950 the EPU merged with the European Movement and Kalergi was elected as honorary president in 1952. Europe’s nations should be guided towards the superstate without their people understanding what is happening. This can be accomplished by successive steps, each disguised as having an economic purpose, but which will eventually and irreversibly lead to federation. The Treaty of Lisbon, which came into effect in December 2009, was the culmination of the conspiracy to achieve superstate by stealth. 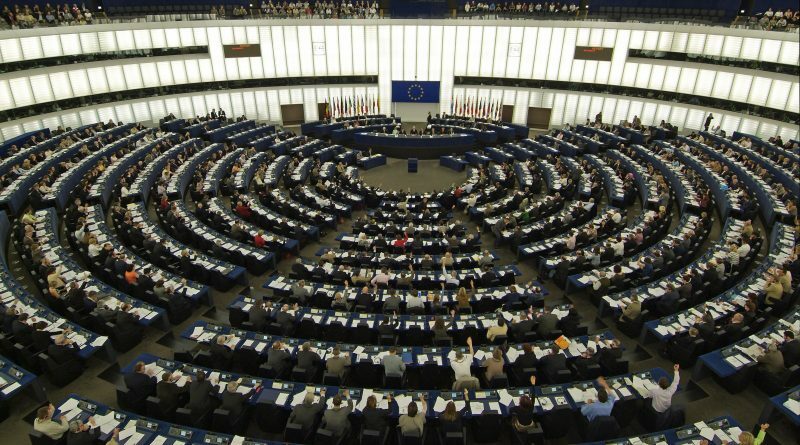 While the cogs are still moving to bring every nation fully under the control of the European Union, the treaty — containing the components the unratified European Constitution of 2004 under a more palatable name — is a blueprint for consolidation of power in the hands of the unelected few. Crucially, it strips the power of veto from national governments while binding all countries to comply with and implement policy passed by those same unelected few. James Warburg’s statement is an extension of Kalergi’s vision to consolidate the entire world into five states. Within just ten years following the end of World War II, Kalergi’s early initiative to establish a united Europe had gained enormous international support and funding, both of which spawned yet more initiatives, movements and organisations, something which was to become the defining feature of the European Union we know today. Currently there are seven primary institutions of the EU: the European Parliament, The European Council, the Council of the European Union, the European Commission, the Court of Justice of the European Union (composed of three courts: the Court of Justice, the General Court and the Civil Service Tribunal), the European Central Bank (composed of the Executive Board, the Governing Council, the General Council and the Supervisory Board), and the Court of Auditors. On top of the seven primary institutions and their offshoots are presently 48 agencies, composed of 37 decentralised agencies, six executive agencies, two Euratom (European Atomic Energy Community) agencies, and three independent bodies. Of the 37 decentralised agencies, eleven were formed over the course of 24 years (1975-1999), whereas 26 were formed over the course of just eleven years (2011-12). Two more agencies are proposed to be included: the European Public Prosecutor’s Office and the European Border and Coast Guard Agency. There are also two consultative committees, the Economic and Social Committee and the Committee of the Regions, plus The European Investment Bank. In addition, there are three inter-institutional bodies: the Publications Office, the European Personnel Selection Office and the European Administrative School. And the European Anti Fraud Office. Next up is the European Civil Service, composed of 34 directorates-general, which serves the European Commission. Then there’s the General Secretariat of the Council of the European Union, composed of seven directorates-general, which serves the Council of the European Union, the Presidency of the Council of the European Union, the European Council and the President of the European Council. Aside from the enormous costs involved in maintaining this bureaucracy, from employee salaries and expenses to overheads on 98 EU buildings in Brussels and Strasbourg, thousands and thousands of reams of paper have been generated to document the 120,000 or so regulations and directives that comprise European law which, significantly, trumps the national law of each country within the European Union. To exercise the Union’s competences, the institutions shall adopt regulations, directives, decisions, recommendations and opinions. – A regulation shall have general application. It shall be binding in its entirety and directly applicable in all Member States. – A directive shall be binding, as to the result to be achieved, upon each Member State to which it is addressed, but shall leave to the national authorities the choice of form and methods. – A decision shall be binding in its entirety upon those to whom it is addressed. – Recommendations and opinions shall have no binding force. Reportedly, if one were to stack the paperwork for all current EU rules and regulations they would reach the top of Nelson’s Column. In other words, 51.6 metres of paper. Let’s say each ream is approximately 6 centimetres tall, this would amount to 860 reams, or 430,000 pages of regulations (much more than Bukovsky refers to below). When you look into all this bizarre activity of the European Union with its 80,000 pages of regulations it looks like Gosplan [the Soviet State Planning Committee] … an organisation which was planning everything in the economy, to the last nut and bolt, five years in advance. Bukovsky draws further parallels between the Soviet Union and the European Union, likening the European Parliament to the Supreme Soviet and the European Commission to the Politburo. I am very carefully watching such structures as Europol for example. They will have to police us on 32 kinds of crimes, two of which are particularly worrying. One is called racism, another is called xenophobia. Someone from the British government told us that those who object to uncontrolled immigration from the Third World will be regarded as racist and those who oppose further European integration will be regarded as xenophobes. If you go through all the structures and features of this emerging European monster you will notice that it more and more resembles the Soviet Union. […] Meanwhile they are introducing more and more ideology. The Soviet Union used to be a state run by ideology. Today’s ideology of the European Union is social-democratic, statist, and a big part of it is also political correctness. I watch very carefully how political correctness spreads and becomes an oppressive ideology. What Bukovsky says about racism, xenophobia and political correctness couldn’t be more relevant today, as the manufactured migrant crisis engulfs Europe and its countries, dividing people from Spain to Hungary. Exactly as Bukovsky warned, those who don’t agree with further immigration are now being painted as racist and/or xenophobic, often being referred to as extremists, fascists or neo-Nazis. There is little in the way of rational discourse of the full implication of increased immigration; instead mainstream media and politicians are quick to scaremonger about the ‘dangers of the extreme right’. Beyond the particulars of racism and xenophobia, broader ‘hate speech’ laws are being adopted by individual countries. Such laws are open to vastly different levels of interpretation and take no account of religious belief or informed understanding and are, therefore, open to misuse and abuse. Given the increasing number of hate speech laws in recent years, it’s highly likely the number of such laws, and/or the articles within such laws, will only continue to increase until every conceivable slight is covered. At which point absurdity will not only have been reached, it will be maxed out. In response to Angela Merkel’s admonition in September 2015 regarding anti-migrant posts on Facebook, Mark Zuckerberg agreed to develop a policy for censoring such posts. In January 2016 Facebook launched the Online Civil Courage Initiative, headed up by Jewish-German ex-Stasi agent, Anetta Kahane who, in 1998, founded Amadeu Antonio Stiftung as a “response to the neo-Nazi subculture that permeates former East Germany and has crept into former West [Germany].” AAS funders include the Ford Foundation and Soros’ Open Society Foundations. George Soros (Hungarian-American-Jewish) was a major funder of colour revolutions and the Arab Spring. Immigration is the future. You cannot work and live in a globalised world — in the middle of the world, in Europe — without immigration and moving populations. So you have to really make a good policy of immigration all over Europe. And we see that the history of Europe with its long history of nationalism and small countries is now getting into a crisis, so this will take a long time to make it better but you have to really change the policy of immigration inside Europe. This is very important, you have to adapt the educational system and adapt all the self-understanding of the States. They are not any more only white or only Swedish or only Portuguese or only German. They are multicultural places in the world. The man of the future will be a mongrel. Today’s races and classes will disappear owing to the disappearing of space, time, and prejudice. The Eurasian-Negroid race of the future, similar in its outward appearance to the Ancient Egyptians, will replace the diversity of peoples with a diversity of individuals. 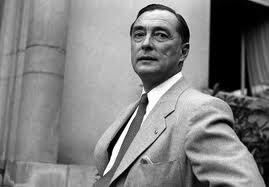 Whether or not Kalergi was advocating for miscegenation or merely suggesting it as an inevitability is not clear from the few available excerpts translated into English, but at this stage of the European game his intentions are irrelevant for the essence has been grasped and thrust upon a largely unsuspecting populace through the current EU policy on migration. There is no place in modern Europe for ethnically pure states. That’s a 19th-century idea and we are trying to transition it into the 21st century, and we are going to do it with multi-ethnic states. 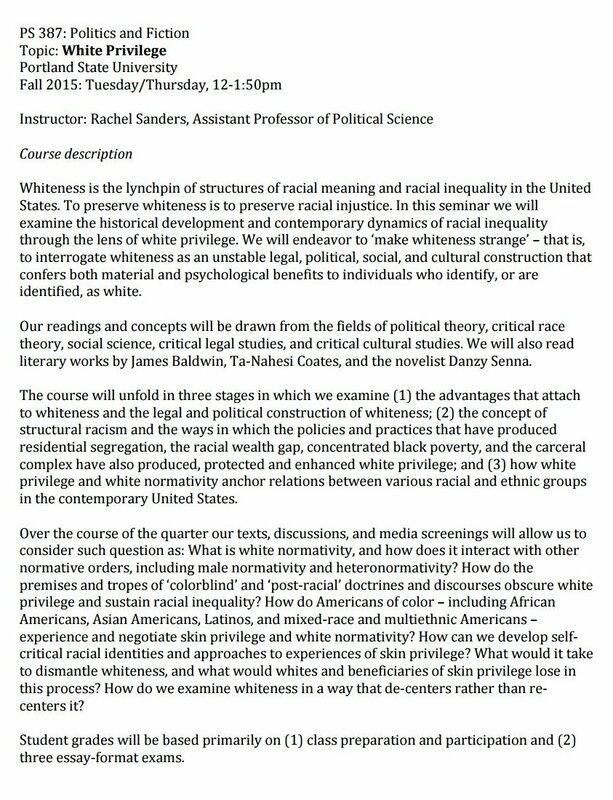 The goal is to meet the challenge of racial interbreeding. The challenge of racial interbreeding that faces us in the 20th century. It’s not a choice, it’s an obligation. It’s imperative. We cannot do otherwise. We risk finding ourselves confronted with major problems. We must change — therefore we will change. All at the same time. In business, in administration, in education, in the political parties. And we will obligate ourselves as to results. If this volunteerism does not work for the Republic then the State will move to still more coercive measures. Should Spectre so desire, she can return to her ‘homeland’, Israel, which strongly defends its own borders while forbidding intermarriage between Jews and non-Jews. In 2012, Benjamin Netanyahu said that the “phenomenon of illegal infiltrators from Africa is extremely serious and threatens Israel’s social fabric and national security”. Insofar as Europe is Christian, it is in a spiritual sense Jewish, insofar as Europe is moral, it is Jewish. […] Now we stand at the threshold of the third epoch of the new times: Socialism. […] This development, and with it the chaos of modern politics will only then find its end, when a spiritual aristocracy seizes the means of power of society: [gun] powder, gold, ink, and use them for the blessing of the general public. If one looks long enough and hard enough, one will see that Kalergi’s so-called moral and spiritual aristocracy has, indeed, seized power and is hard at work on both consolidating the socialist third epoch and replacing ethnic Europeans through migration and miscegenation. Due to sustained brainwashing over the past 70 years, many folk still resist connecting the dots and refuse to see the picture that emerges, but the reality is the very Jews who Kalergi held aloft not only supported and funded his initiatives, but also hold a disproportionate number of powerful and influential positions, within the European Union and its member countries today. 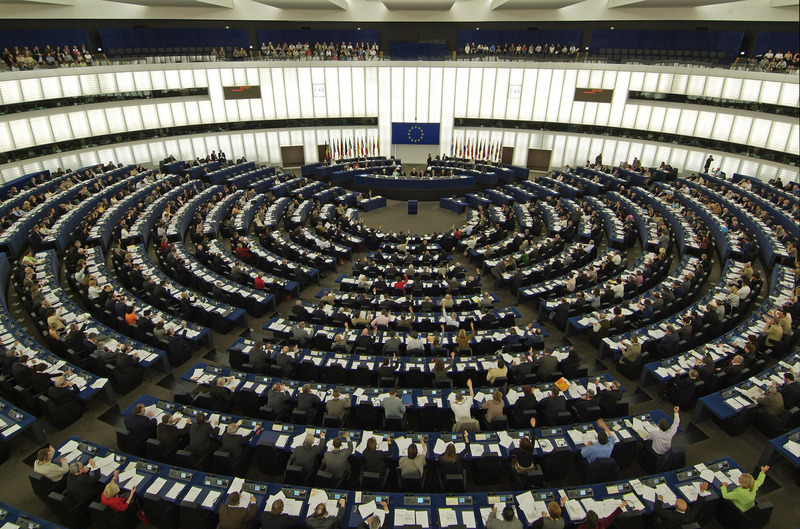 These positions are not only official ones at the EU and national government level, but also culturally influential ones, such as within the news media, television, the movie industry, the music industry, and so on. Societal, cultural and economic change is being imposed through legislation, regulations, policy directives, lobby groups and think tanks, all of which are supported by the media, which also propagates sanctioned thought (ink), economies are being manipulated through central banks and the stock exchange (gold), and our inalienable rights are being subjugated through an ever increasing number of tyrannical laws, backed up by force (gun powder) or the mere threat of force, which for the majority of people is all that’s required to ensure compliance. Europe today would be largely unrecognisable to Hemingway. What we have gained with open borders we have lost in individual freedoms as more and more aspects of our lives are subjected to taxation, regulation, surveillance and political correctness. The heterogeneity of our national cultures and populations is being progressively homogenised. EU business compliance regulations and economic policies, combined with globalisation, are massively impacting businesses and economies with many businesses, especially small businesses that have to pay high certification fees, struggling to survive. Meanwhile city centres increasingly house the same chain stores and coffee shops. Mass immigration, combined with ‘replacement migration’, is rapidly changing the face of Europe as ethnic Europeans become a minority in major European cities. Ten, twenty, thirty years from now what will life be like in Europe? Given the European Union juggernaut will continue to roll, creating ever more regulations and allowing many more migrants to live and work within its borders, the outcome shouldn’t be much of a surprise. In true serpentine fashion, the Hydra that is the European Union will suffocate what once defined Europe: sovereignty of nations, and a diversity of free peoples and culture. ← What Exactly is Anti-Semitism?